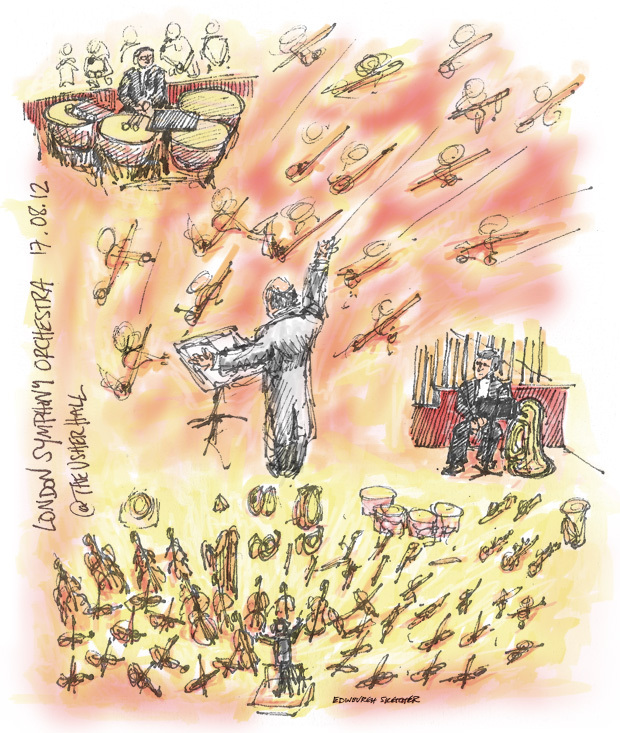 Last week I was lucky enough to visit the Usher Hall to see the London Symphony Orchestra, here is my sketchblog montage of the night. “What a treat, back at the Usher Hall for my second performance in a week. On Monday I saw Scottish Chamber Orchestra’s production of A Midsummer Nights Dream and tonight I was lucky enough to see the London Symphony Orchestra perform Brahms’s Second and Szymanowski’s Second Symphony. The orchestra included many more violins than the previous concert and as I watched I found the rhythm of the synchronised bows hypnotising. I wanted to capture their dominance over my view in the sketch, along with the conductor who had them all dancing. Brahms’s Second was lovely but the real power and drama came after the break in Szymanowski’s Second Symphony. Much of that power came from the four huge drums and the brass section. I drew them in the close ups as they silently waited for their moment. This week I tried something a little different, a montage of the night rather than individual sketches and coloured on the computer rather than watercolour. What do you think? This week I’ll be visiting the Festival Theatre for the ballet Cinderella.